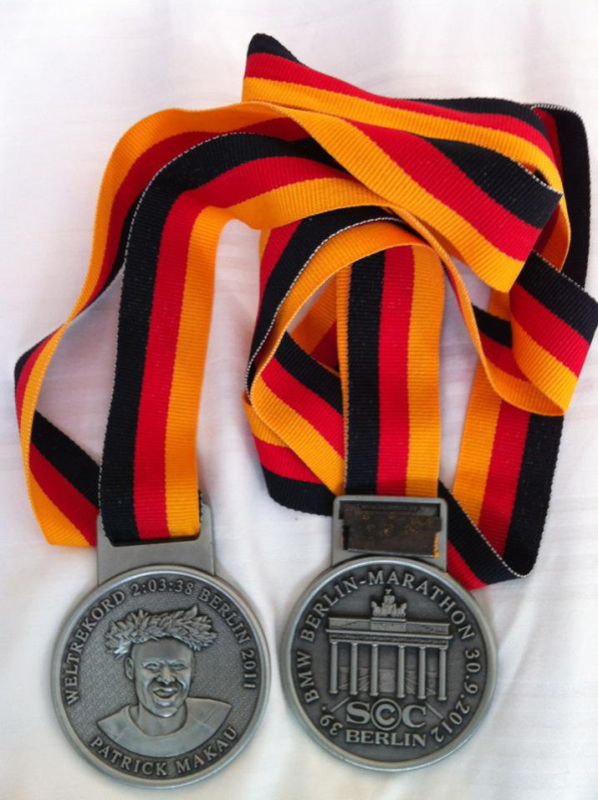 Berlin Marathon in 2010 was my second marathon after the under par experience in Nordmarka Forest marathon a few months earlier. I really had given up the idea of participating and had even cancelled my plane ticket, but had a change of heart the week before the race and booked a new trip to Berlin; outbound on Saturday morning and inbound on Sunday night, right after the race. Well, race day arrived with rain and cold weather and that resulted in burns and blisters ALL over due to friction (like 1×10 cm opened wound in the back of each knee caused by my Rehband kneewarmers. My clothes was not quite up to speed either, for example, I wore a regular bra, which gave me bra shaped burns. I also got burns from my ear-phones, so all in all, not my finest moment. But, the course itself was amazing and despite the poor weather, Berlin was crowded with people cheering us on (or, to be honest, I do not speak German, so I am just guessing they were cheering). 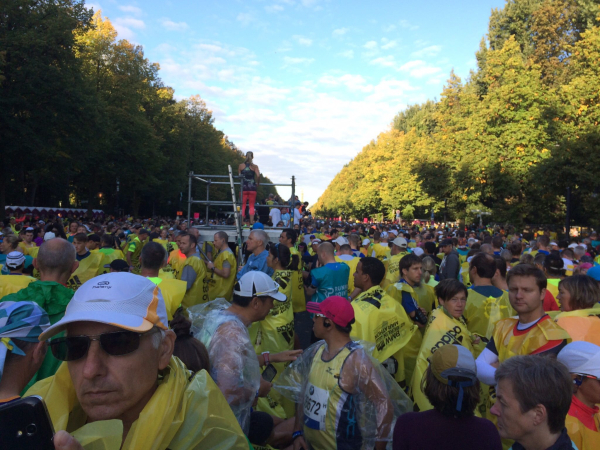 The last 1000m is up the Unter den Linden. On the map it looks totally flat, but at the end of a 42,2km race, it feels like a giant hill. On the top of the “hill” is Brandenburger Tor and I when I saw it, I was totally sure that that was the finishing line. No such luck… When reaching Brandenburger Tor, I saw that I had to crawl for an additional 2-300 meters. Passing the finishing line was amazing and some tears found their way down my cheek there in the rain, but was quickly replaced with the biggest grin when I got the medal around my neck. Well, the race was over and I had to revert back to my hotel for a quick shower and then pack up my stuff and go straight to the airport. The hotel was approximately 1 km from the finishing line, but it took me 45 minutes to reach it. I had to have like 20 breaks on the way where I sat down on the wet ground and felt very sorry for myself. But, I did get a lot of sympathetic looks along the way at least… When I finally reached the hotel, and went into the shower, I started to cry like a little baby when the water hit all my burns. The pain was excruciating and I barely managed to get undress afterwards. Then I had to rush off to the airport, where I received a sms from some colleagues, who had also done the race, asking me to join them for drinks and dinner. Instead, I had to sit 2 hours on a plane with poor leg room, reach Gardermoen at midnight and then drive the 2 hours back home and then be at work at 8 the next morning. In 2016 am back for the third time, along with a bunch of friends. One of the days we were going for a picnic in Tiergarten and had laid out all the food and were halfway down our prosecco glass when we suddenly noticed that everyone around us were naked. It turned out that we had managed to pick the nudist part of the park for our picnic. We tried to look indifferent, but when a couple of the guys started to stretch, we simply couldn’t be there anymore (I still have some mental pictures of the whole thing I am unable to get rid of…). This was the year I felt a pressure throughout the race, had to take an EKG after crossing the finishing line, resulting in an ambulance to the hospital where I was admitted with severe kidney failure. 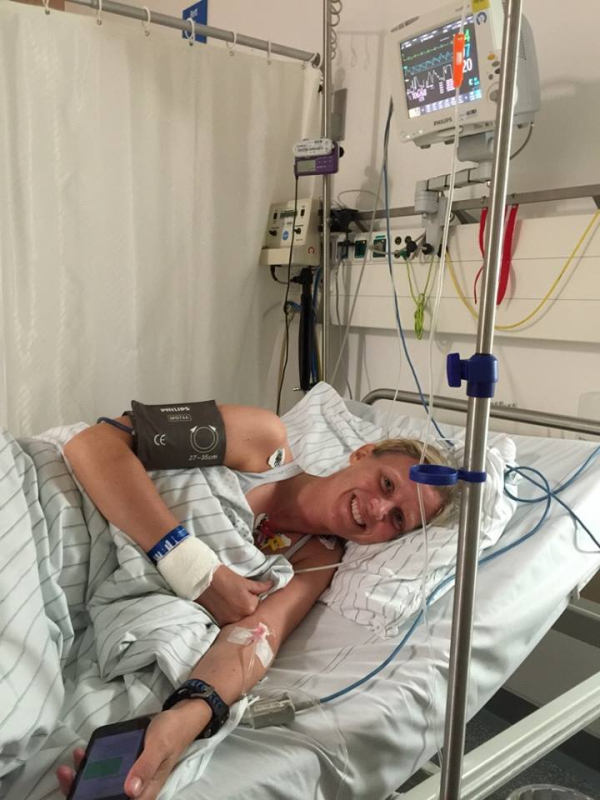 So, instead of celebrating with champagne, I got an IV and a hospital bed… lucky me.. Note to self for next time… 2XU compression tights, sweater and socks can be challenging if admitted into the hospital for a check. My bloated body stretched the clothes to their final limit, and they almost had to cut them apart to get them off me for examination. The next morning, I was well enough to leave the hospital and luckily we had a couple of more days in Berlin before we had to go home. We staid at the Intercontinental Hotel Berlin and when we showed up for breakfast on our last day, we noticed that they were actually serving prosecco. A bit early for us, but we thought, what the H***. When in Rome (or Berlin in this case..) do as the Romans (or the Berliners). After breakfast it was time to pack up our stuff and, a bit tipsy, we went to the airport for our return flag.